As humans, our closest living relatives are the chimpanzees. This term, chimpanzee, can be used in a general sense referring to the species within the genus Pan. 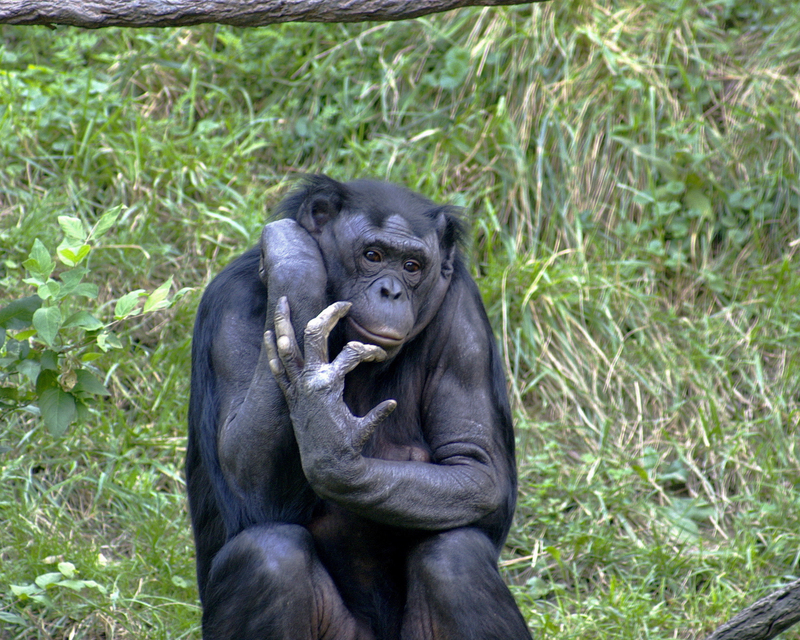 This includes both Pan troglodytes, the “common” chimpanzee, and Pan paniscus, the “bonobo” chimpanzee. Studying these organisms, as well as the rest of the great apes, has been extremely helpful for scientists attempting to paint an evolutionary picture. It has also debunked the concept of “Man the Toolmaker”. While our species does have a particular reliance on technology, arguably greater so than any other species on the planet, we are not the only toolmakers. In fact, chimpanzees have a fairly impressive tool-kit that allows them to engage in complex activities. With this in mind, we can begin comparing “Man the Toolmaker” to “Chimpanzee the Toolmaker” by looking at three complex behaviors that wild chimpanzees partake in. These are nut-cracking, termite fishing, and the skewering of bush-babies using “spears”. While nut-cracking may seem simple to some, it is actually a complex behavior that requires the use of two different stone tools. Nut-cracking requires both a “hammer” stone and an “anvil” stone. The nut is positioned onto the anvil and then struck with the hammer in order to crack open the tough outer shell of the nut to release the food reward in the center. A study by Boesch in 1991 discusses events in which mother chimpanzees would “provide” nuts or stones to their offspring to assist in nut-cracking. However, another study that also reviewed Boesch’s work (Lonsdorf, 2013) pointed out that the mothers seemed to be simply tolerant of their children taking the materials that they were working with. This brings about the question as to whether or not the mothers were actively making an effort to “teach” their offspring in these scenarios. Recent studies have shown forms of teaching among chimpanzees regarding termite fishing (Musgrave, et al. 2016). Termite fishing is another complex behavior that requires the use of two different tools. 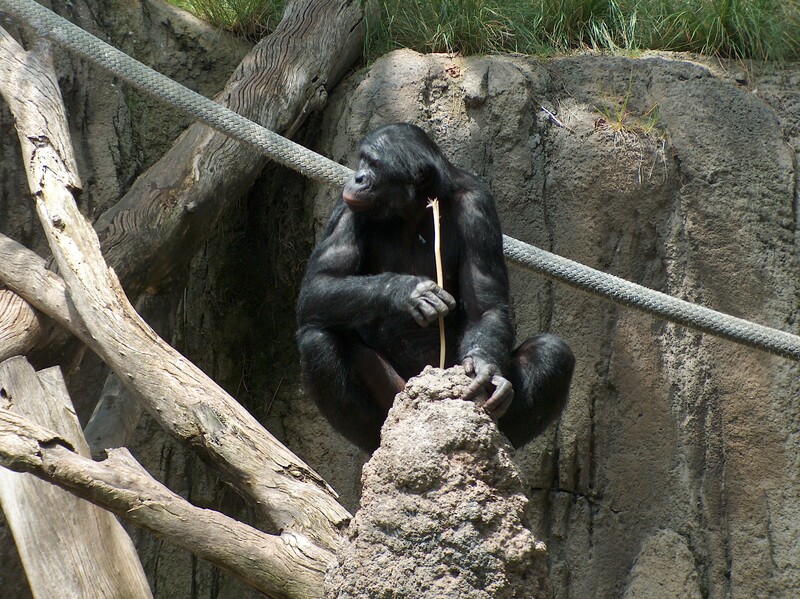 In this scenario, a certain degree of future planning can be observed as the chimpanzee uses two sticks designed for different tasks. The first stick is generally stronger and more durable than the second as it is used simply to perforate the termite mound. Once this action has been performed, the second stick is then thrust into the mound and held there until termites begin to attack it. The stick can then be extracted, allowing the chimpanzee to eat the termites that are clinging on. Some groups of chimpanzees will also pull the end of the stick through their teeth before inserting it into the termite mound to craft a certain “brush-tip wand”. This has been shown to increase the efficiency of capturing termites and is an example of tool modification (Sanz, Call, & Morgan, 2009). It is actually quite difficult to demonstrate teaching in the wild. However, researchers have now shown that some wild chimpanzees from the Goualougo Triangle actually donate termite fishing probes to naïve learners (Musgrave, et al. 2016). Regardless of the intentions of the “teacher” in this scenario, the researchers argue that teaching has occurred if three stipulations have been fulfilled. These stipulations are: “they occur in a learner’s presence, are costly to the teacher, and improve the learner’s performance.” Throughout this study, it is shown that these three criteria are met through this donation process. It is also suggested that teaching may be necessary for this particular activity because it is so complex. The chimpanzees here must make specialized, frayed tools from specific raw materials. Through studies like these, it is clear that teaching is not a uniquely human phenomenon. Teaching is not the only activity recently thought to be unique to humans that we later observed in chimpanzees. Once scientists began noting that chimpanzees use and make their own tools, they then came up with the idea that humans were the only ones to use tools for advanced hunting. In other words, humans perform “tool-assisted predation” that goes well beyond using sticks to gather termites, but is this solely a human activity? As it turns out, some chimpanzees use tools to hunt monkeys known as bushbabies (Pruetz & Bertolani, 2007). Since these monkeys are nocturnal, they often can be found sleeping inside of hollow trees during the day. To get to these monkeys, chimpanzees will sometimes find holes in the tree and stab sharp sticks into them in an attempt to skewer the monkeys before they can get away. These chimpanzees have been observed personally modifying sticks for this purpose, stripping them of branches and sharpening the tip with their teeth. Clearly, they are adept hunters. With these examples in mind, one may begin to question what activities are unique to humans. Where exactly do we draw the line that defines humanity? For my next blog post, I will further discuss this concept and chimpanzees through some of the data that have been gathered from controlled experiments. Until next time, carry on with curiosity. Boesch, C. (1991). 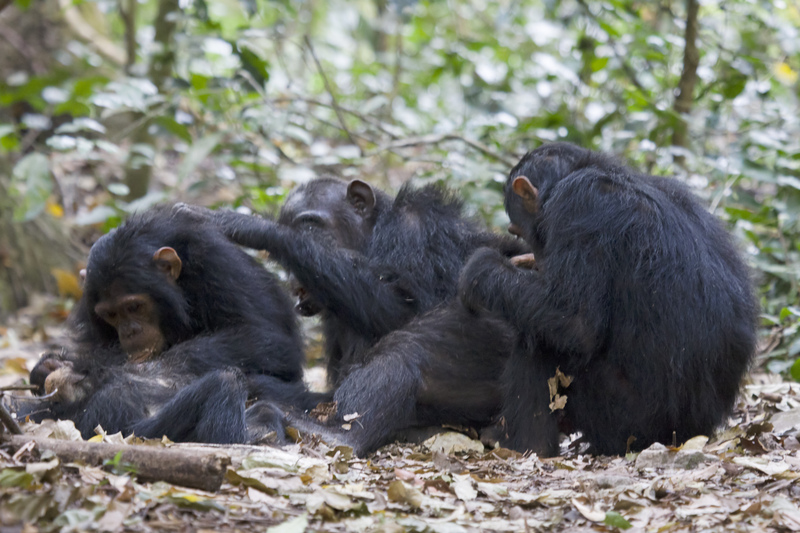 Teaching among wild chimpanzees. Animal Behaviour, 41(3), 530-532. Lonsdorf, E. V. (2013). The role of mothers in the development of complex skills in chimpanzees. In Building Babies (pp. 303-318). Springer New York. Musgrave, S., Morgan, D., Lonsdorf, E., Mundry, R., & Sanz, C. (2016). Tool transfers are a form of teaching among chimpanzees. Scientific Reports, 6. Sanz, C., Call, J., & Morgan, D. (2009). Design complexity in termite-fishing tools of chimpanzees (Pan troglodytes). Biology Letters, 5(3), 293-296. Pruetz, J. D., & Bertolani, P. (2007). Savanna chimpanzees, Pan troglodytes verus, hunt with tools. Current Biology, 17(5), 412-417.